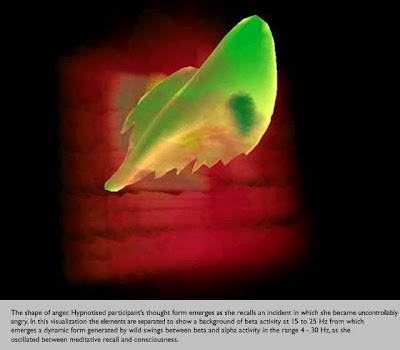 An interesting sci-art collaboration between University of Calgary researchers and artists Alan Dunning and Paul Woodrow, attempting to visualize thought in 3D space. They completed a number of projects under the umbrella of the Einstein's Brain Project; this one titled The Shapes of Thought. The project asked participants to recall traumatic events from their past. They were asked to emote anger, and other primary emotions. Each participant was wired to EEG and EKG sensors and monitored [for as long as 8-14 hours]. The resulting information was visualized as still images using Iris Explorer and visualized in realtime, interactive space using specially developed data acquisition modules. Other images on the site include that of a man repeatedly asked to recall an incident in which he was severely injured, including a period of agitation, and couple of animations. Controversial but nice application with experimental fact. One beautiful theory of consciousness I heard at a neuroscience lecture is that of an symphony orchestra, ie the perception[music] transcends its component parts [instruments] ie similar to emergence theories. There is no need for fusion. I attended a Workshop on Brain Fitness hosted by Linda Schaumloeffel with www.powerbrainfitness.com and even bought some of her books. It is so amazing how this works and never know that we can reprogram our brain to such extend. I am getting more and more into that. I think it is a great epierment, it looks like anger to me. "If you see you still may not believe it." Great post. It's interesting to think that maybe one day we will be able to have and accurate visualization of human emotions. "The brain is the wildcard"